So glad you liked this one so well, FictionFan. I think Padura is a very talented writer, and he does such a good job of evoking time and place. If you decide you have the time to try his Mario Conde series, I recommend that, too. I’ll certainly try to fit in his other books. Although there was the Cuban strand in this one, it was the least developed of the three, so I’d be keen to read his books that are fully set there. This one seems something of a strange departure for him from his other stuff, but you could tell it was a subject he felt strongly about. Interesting post! Haven’t heard of this one. Thank you! I only came across it because I’ve been reading so much about the Russian Revolution this year, but I’m glad I did – not the easiest read in the world, but a good one. I’m having enough trouble with current Russian politics – this may be a book for later! Another post where you teach me something about a period of history I didn’t know. 🙂 I don’t think I’ll be adding it to my TBR just yet 😉 but I enjoyed your review! Well although my TBR is safe (I definitely don’t have the required background knowledge) this does sound fascinating apart from Ivan’s story which you brilliantly (or brutally) dismissed! Hahaha – I was a bit brutal, wasn’t I? But he deserved it… 😉 No, I won’t be doing any arm-twisting on this one – definitely only for Russian Revolution nerds… like me! This sounds hugely ambitious and as if it succeeds for the most part. I’ll have to do some background reading first though! This sounds much too complicated for me, but good for you for even attempting to grasp at world politics, especially across history-it’s a never-ending topic! Civil War is such a strange title, isn’t it? After you, Senor, no, no, after YOU Senor. Au contraire (or Spanish equivalent) Don Senor, I INSIST you must take precedence. Not for me, as too far over my head. I like the photo with Frida Kahlo though. What! Really? I did not know that! I know! It’s such an odd thought! Apparently he was quite obsessed by her for a bit… much to the annoyance of his wife and her husband…! I read up about their affair, apparently she wanted to make her husband jealous since he had been messing around with her sister! Then, it seems as if Frida had also known Trotsky’s assassin socially! I’m going to have to read more about this. I like art, but usually look at the pictures rather than reading about the artist’s life. Exhausting is right! They all sound mad! This does sound fascinating! And it has Frida Kahlo too! But I agree with Big Sister. Life today is harrowing enough. Yep, it’s beginning to feel very much like the cold war all over again. Let’s hope it stays cold, though! 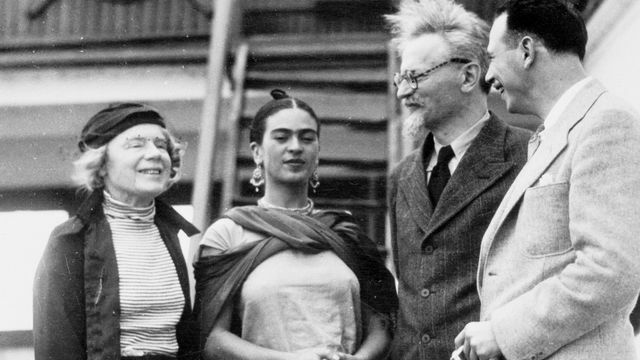 I had no idea Trotsky and Frida Kahlo had an affair – the things you learn in books…!! Within the past year I watched that movie about Frida Kahlo starring Salma Hayak. I wasn’t aware until that movie that she helped Trotsky and believed in his cause. It’s funny you mention writers writing about writing. When I was in creative writing programs, everyone was under the impression to write about writing was downright taboo–lazy even. I waited until I had read this one myself before reading your review, and now I’m pleased I was able to look at it. I feel much the same as you, although I enjoyed the sections on Ivan and his struggles to lead a good, useful life under the Cuban regime, perhaps because I had recently been on holiday to Cuba myself. I definitely agree with you about Trotsky though. 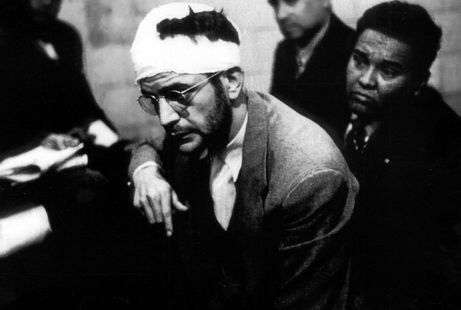 He was a man with blood on his hands (as was Che Guevara, who personally shot deserters from his army).